New life for old stories: 3 that have been done to death – and why you should write them anyway. But don’t let that worry you. Here are three books that have been written over and over and over… but which will always be fresh and interesting, with just a little spin. When I decided to take an online children’s picture book writing course, I had no idea where to start (I’ll tell you where I ended up later on, and offer a few more good suggestions as well.). Googling “children’s picture-book writing course” turns up a dizzying range of courses, from universities (expensive!) to individual authors’ homemade courses (sketchy?). Some claim to have been around for 30-some-odd years, while many others have popped up overnight. All these courses claim to be the BEST. How can you tell them apart? The good news is that you can find decent courses at a few different price levels. As for which ones will actually help you get ahead… I’m convinced that has more to do with your attitude than with the teacher (as long as he/she is reasonably competent). I’ve taken a bunch of creative writing classes, both online and in person. Some were good, a couple were great… one (in-person at a major university) was pretty bad: we spent much of the time looking at the professor’s own (mediocre) writing. 1. What is my goal for the course? Do you want to get your story down on paper? Are you struggling with stilted language? Or are you at the stage of figuring out how to get it in front of as many publishers as possible? In which I read the blogs so you don’t have to. But seriously, you SHOULD. There is a ton of wisdom out there, floating around for free. Yes, you should still buy and read books on writing – there’s something to be said for information presented systematically in a consistent voice – but the right blog “nudge” at the right time can give you a push, an inspiration, and get you headed in the right direction. Here are four nuggets I discovered this week that I think can help us all become better writers (and, in one case, self-publishers). You now have a choice of two sizes for your free template. Download one or both - enjoy! Find all the juicy details on the 6" x 9" size (and why I'm now offering both) over here. Special gift for mailing list subscribers! Like a good blueprint, a standard template can get you started on the road to creating a self-published book that doesn’t look and “feel” self-published. This template produces a standard 8.5” x 8.5” book, including as many pages of text as you like, as well as front and back matter, the stuff that goes before and after your story. The page size is actually a little bigger, by 0.13” all around. This is the “bleed” recommended by CreateSpace and other on-demand publishers. There’s even an “About the Author” page at the end for you to fill in your personal details. This template will make formatting your children’s book for print-on-demand super-easy… all in a beguiling purple colour (don’t worry, you can change it). 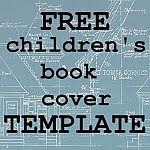 To instantly receive this 8.5” x 8.5” FREE children’s book template, sign up for the mailing list in the box at the top-right corner of this page!